Buckhead Betty ... on a Budget: In need of a cheap outing in ATL this weekend? In need of a cheap outing in ATL this weekend? Ah, well then I have stumbled across a gold mine of events for you to consider. The fine people at The Weekly Scene have put together everything in a nice little website. This is of course to the sadness of people like my cool friend Liz who usually emails this kind of thing out once a week, but I think we can never have too many options, right? 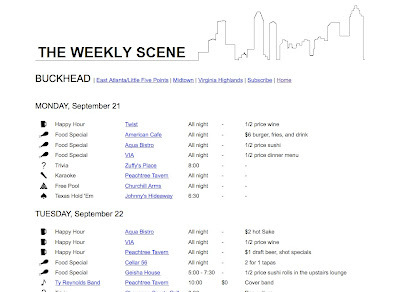 They profile the week's events in Buckhead, Va-Hi, Midtown, East Atlanta, and include food and drink specials, concerts, and other various events. Do you have plans at any of these places this weekend?